HONOLULU, Hawaii, February 24, 2013 (ENS) – The federal government is preparing to drop dead mice laced with a snake toxicant into the jungles of Guam in the latest effort to control the thousands of brown tree snakes that have invaded the Pacific island. After struggling for decades to keep the nocturnal, invasive snakes in check on Guam and out of Hawaii other Pacific islands, this spring, helicopters will be used to drop dead neonatal mice – each laced with 80 mg with the painkiller acetaminophen. The painkiller is deadly to snakes, but harmless to humans. The mice will be attached to flotation streamers that will catch on tree branches where the snakes feed, so they don’t fall to the ground to rot or be eaten by other animals. Last fall, scientists with the U.S. Department of Agriculture’s Wildlife Services’ National Wildlife Research Center in Fort Collins, Colorado published a study in the journal “Human-Wildlife Interactions” comparing this method of controlling the brown tree snake with trapping the troublesome snakes. The brown tree snake, Boiga irregularis, is an invasive species native to northern Australia, New Guinea and the Solomon Islands. They were accidentally transported to the snake-free island of Guam shortly after World War II as stowaways in cargo. In the absence of natural predators and an abundant food supply the snakes colonized the entire island of Guam. Now, population densities in some areas are as high as 50 to 100 snakes per hectare (about half a square mile). 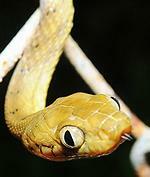 Brown tree snakes are generally dark yellow, or brown with light stripes. 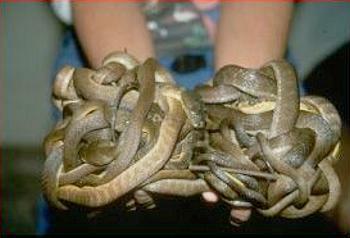 The average brown tree snake is two to four feet long, though the largest caught on Guam measured 10 feet in length. The snakes have four rows of top teethand two rows of bottom teeth. Mildly venomous, the snakes are dangerous to small children and domestic animals, and an environmental disaster. They disrupt the island’s power supply about once every three days, damaging electrical appliances and interrupting commerce, banking, air transportation and medical services. The snakes have even caused island-wide blackouts. The snakes cause power outages by climbing the guy wires leading to power poles supporting transformers, distribution lines, and high-voltage transmission lines. When they simultaneously touch live and grounded conductors, the snakes create faults, short circuits, and electrical damages. The brown tree snake is responsible for the decline and extinction of many native birds and lizards on Guam. Until now the tools used in snake containment programs have been traps containing live mouse lures, hand capture, and detector dog teams. 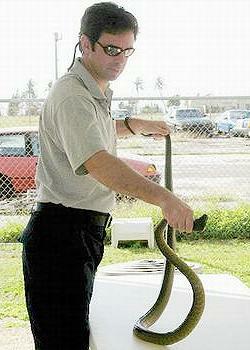 In 2011, some 12,000 thousand brown tree snakes were captured by the USDA on Guam, roughly 4,000 of them on Andersen Air Force Base. Many of these captures are credited to Jack Russell terriers that are trained to locate and capture the snakes. There are 24 USDA-trained terriers working with teams at Andersen and at Naval Base Guam. Jack Russells are used for these inspections because they are agile, highly energetic. Naturally aggressive, their hunting skills make them perfect for detecting brown tree snakes. Since Guam is a major transportation hub in the Pacific, every plane presents opportunities for brown tree snakes from Guam to stow away and invade other islands. Hawaii is particularly vulnerable. In 2010, the Hawaii Invasive Species Council warned that if brown tree snakes arrived in the Hawaiian islands, economic damage could hit $2.14 billion annually. Tourism would suffer the greatest impact with loss estimates of almost $1.4 billion; power outages could cost the state $761 million; and medical treatment could reach as high as $383,040. Currently, brown tree snakes are not known to be present in Hawaii, although a total of eight of these snakes were found live or dead in Hawaii between 1981 and 1998. All snakes were associated with the movement of civilian and military vehicles or cargo from Guam. USDA personnel on Guam are dedicated to preventing this. “We have 1,400 snake traps in operation in areas such as the flightline, the munitions storage areas and base housing,” said USDA wildlife biologist Kan Dhillon. Still, the snakes have proliferated, their numbers overwhelming existing control tools. The acetaminophen-laced mice may be more effective, but there are no guarantees, warn the USDA research scientists from Fort Collins.